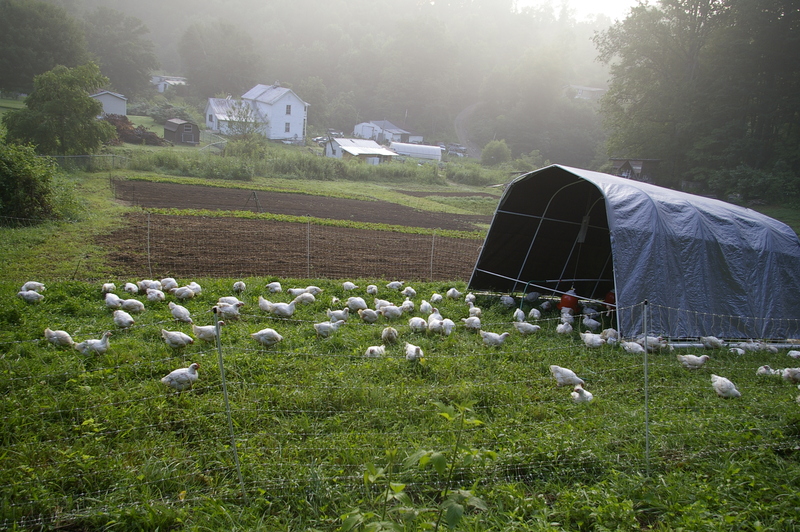 Our poultry are raised on fresh grassy pastures or rotated through spent garden beds to clean them up and glean the leftovers. They get lots of bugs, seeds and a ration of soybean meal, corn, and Fertrell Nutribalancer (an NOP approved premix for poultry that boasts kelp meal as one of its top ingredients) custom milled just for us. 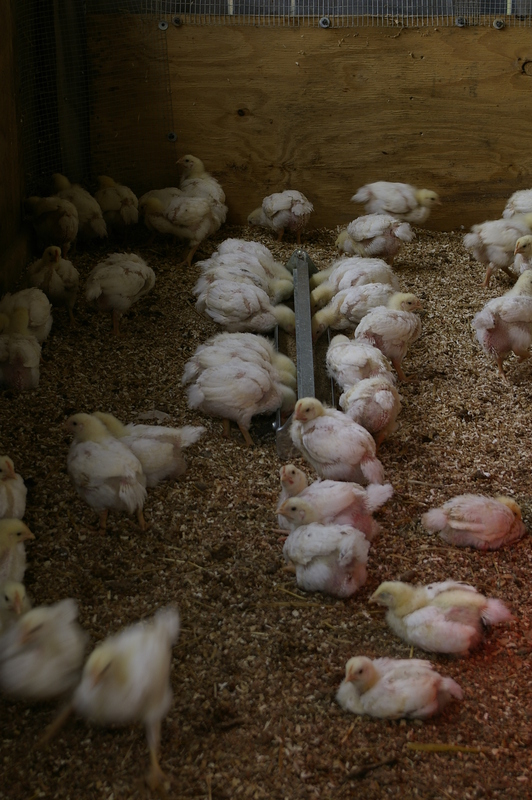 Our poultry are never fed or administered antibiotics or animal by-products. Our birds come to us as day-old chicks. We raise them in the brooder house for 2 – 4 weeks under a propane heat source, depending on the season and weather conditions. They are also loved and held daily by our livestock managers that are fond of tiny baby birds! Our birds are then put out onto pasture or spent garden beds where they enjoy the addition of grass, weeds, leftover veggies, and bugs to their diet. They are sheltered under a framed tarp and rotated onto fresh grass. 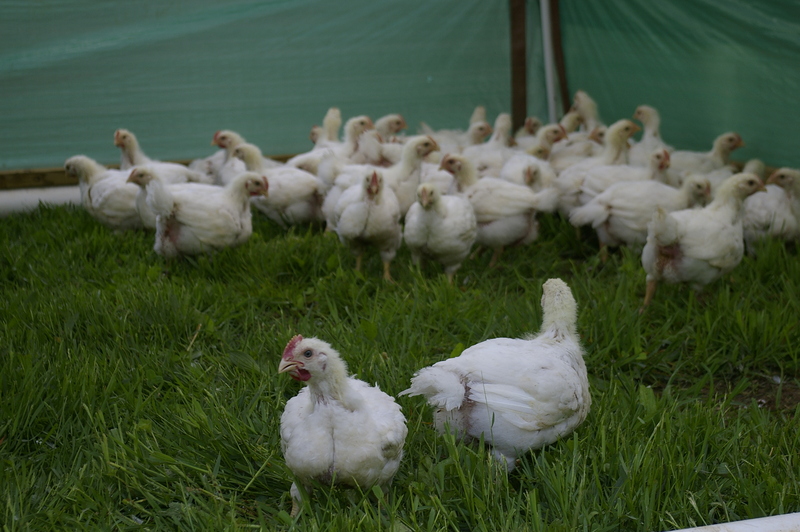 We raise these broilers for about 6-8 weeks before processing them. 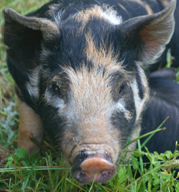 We buy our pigs weaned eight week old from a breeder in Hickory, NC and finish them for 4 – 6 months on our farm. They are then processed at a USDA inspected facility in Taylorsville, NC and we get the meat back in tidy shrink wrapped portion cut packages with the USDA seal. We feed our pigs a locally milled ration of soybean meal, Jackson County corn, and a balanced mix of vitamins … oh and don’t forget the plethora of vegetable scraps from our gardens during the growing season! Our feed does not contain antibiotics or animal by-products. 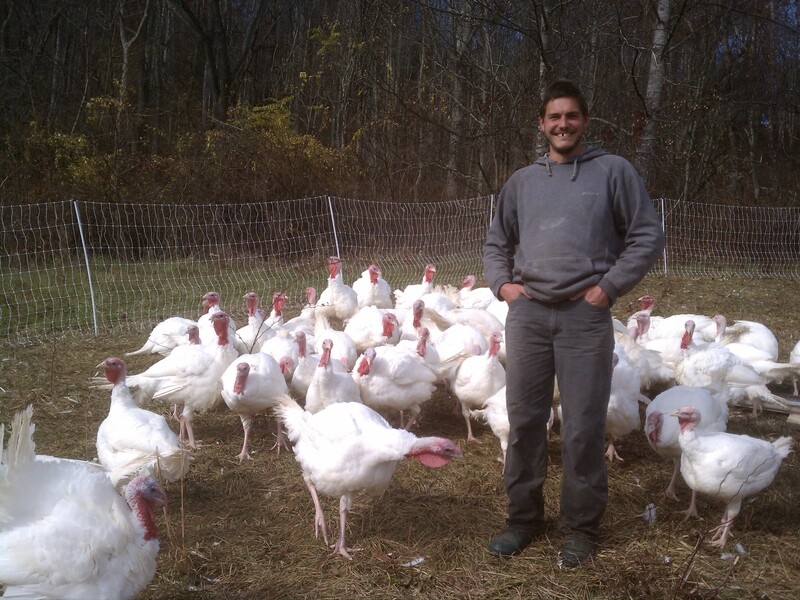 We raised our first batch of Thanksgiving Turkey’s in the 2011 season and they did so well that we’re raising twice as many this year. Our Turkey’s are raised similarly to our chickens on fresh grass, spent garden beds, bugs, seeds and a locally milled ration of soybean meal, corn, oats and Fertrell Nutribalancer (an NOP approved premix for poultry that boasts kelp meal as one of its top ingredients). Our turkey’s are never fed or administered antibiotics or animal by-products. Turkey’s are picked up fresh at the farm, the week of Thanksgiving.